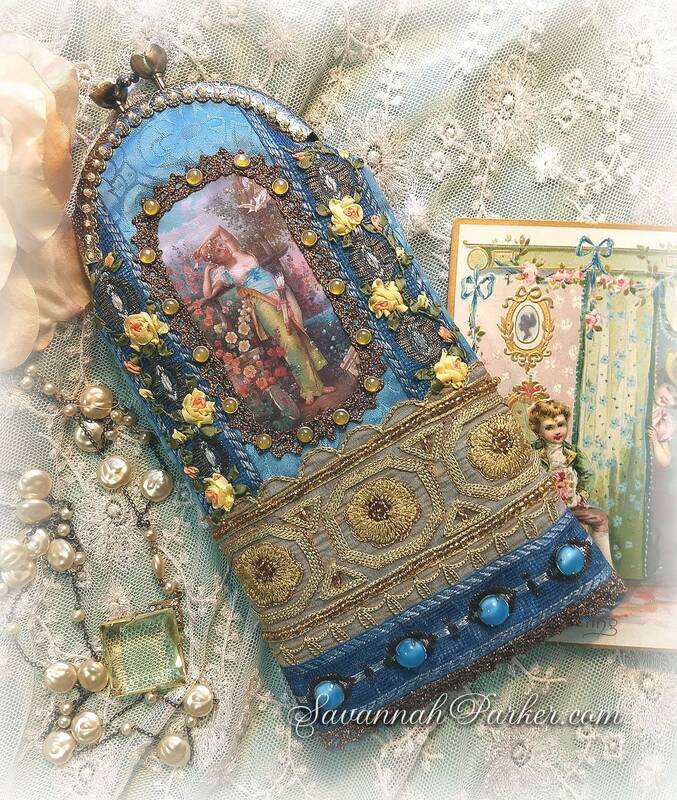 Exquisite and extraordinary little Art Nouveau Silk Ribbonwork Embroidery and antique glass jewels cell phone and or eyeglass case/pouch......a brand new style from my fabulous antique-inspired, totally romantic original bags/purses line---previous ones have sold out super-quickly so am planning a whole new group of new ones, all with exquisite silk ribbon embroidery! 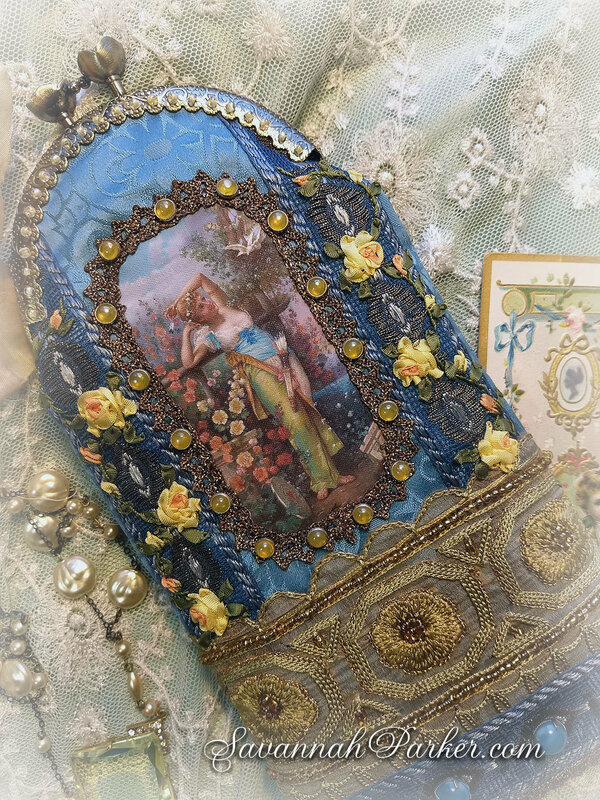 SO useful for a supremely elegant and one of kind carrier for your eyeglasses AND/OR standard cell phone (please check measurements listed below to make sure this will fit your phone as there are no returns) This ready to ship immediately beauty is lavished with antique trims and jewels in different designs and types, as well as delicate hand embroidered silk ribbon roses, buds and leaves and glass beadwork. 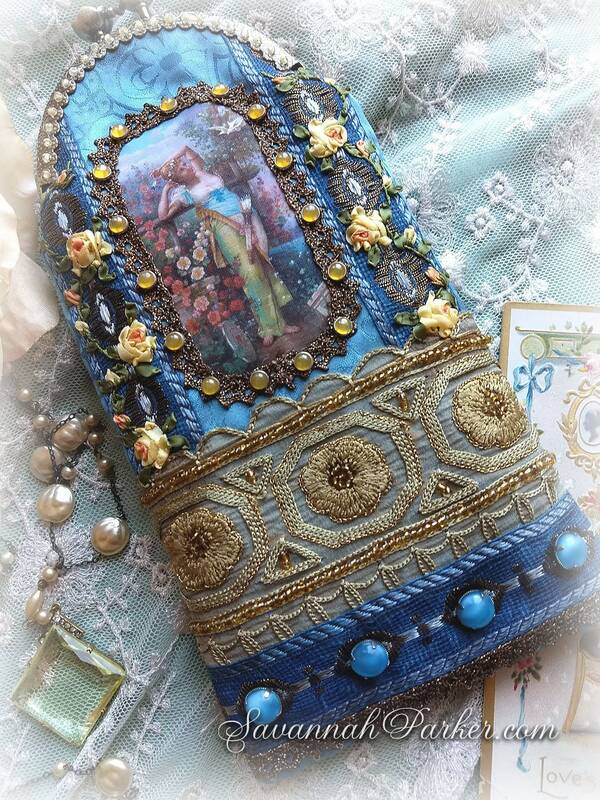 I decided to design my own very antique-inspired pieces that incorporate some of the exquisite laces, trims & materials in my never ending stash, with elegant, precise & clean rather than "tattered" details....you won't find any raw edges or haphazardly tacked-on stuff here, only the fabulous vintage elements and fine-couture quality finishing that is the standard for all my creations ;-) So perfect for a gift for that someone "who has everything"......this is one of a kind and it's not only useful, it's exquisite! PLEASE BE SURE to read ALL of the description especially the measurements and shipping times, BEFORE asking any questions---and do be absolutely positive this piece will match your requirements, as there are no refunds or returns. 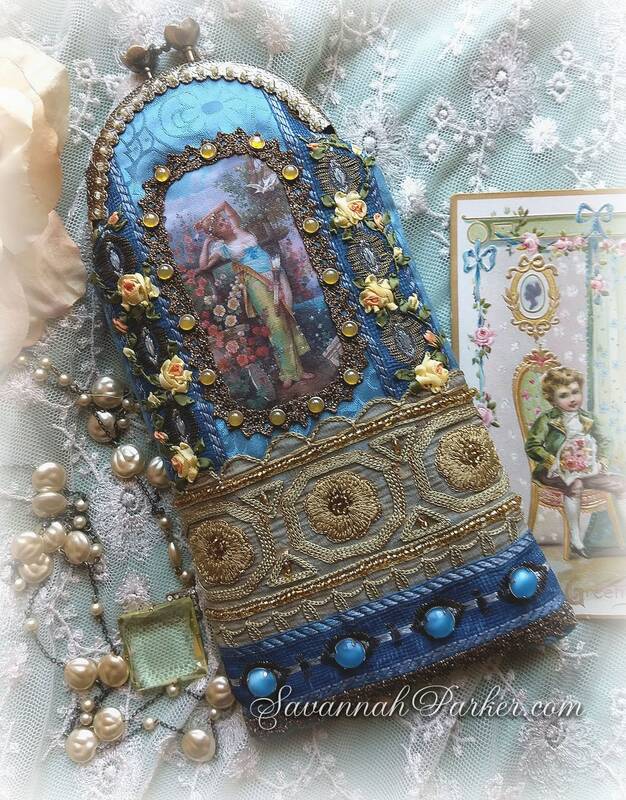 This piece is one of a kind and ready to ship immediately. 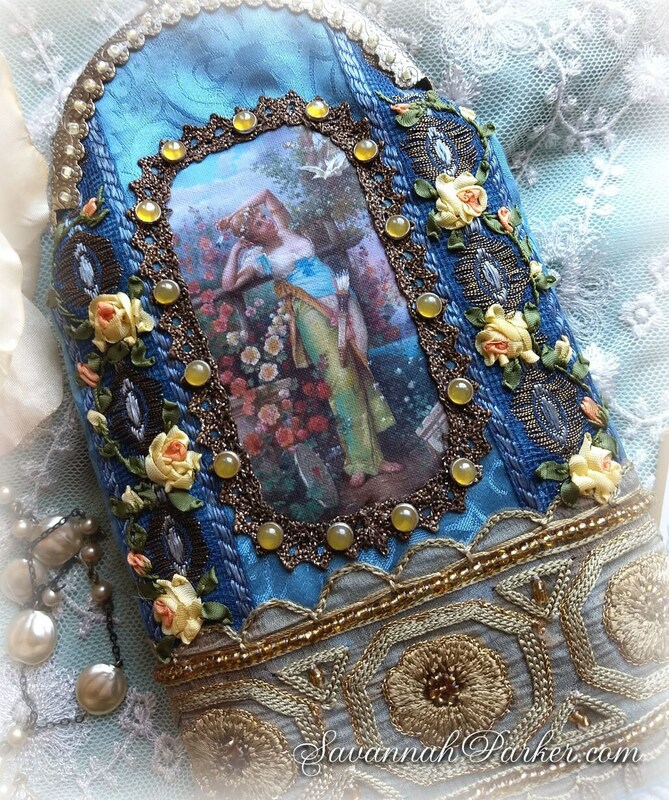 I love antique and vintage clothing and have collected it for years, as well as having a longtime design career including doing costume & restoration work for major movie studios and museums....Am now translating that love to my own contemporary creations and using all the fine extraordinary antique and vintage materials, laces, trims, beads etc that I've collected for more than 30 years in these wonderful wearable pieces....along with the finest of hand sewing and one of a kind details. Everything I create is individually hand made solely by me and has the very best of my carefully hoarded private stash of superb old accents (I use ONLY vintage materials that are in pristine, freshly-cleaned condition---no deteriorating, too-aged or rotting pieces EVER) plus the finest of modern silks, cottons and wools that I can find.....resulting in a fabulous truly authentic vintage look piece. Impeccable professional workmanship and design are the hallmarks here! 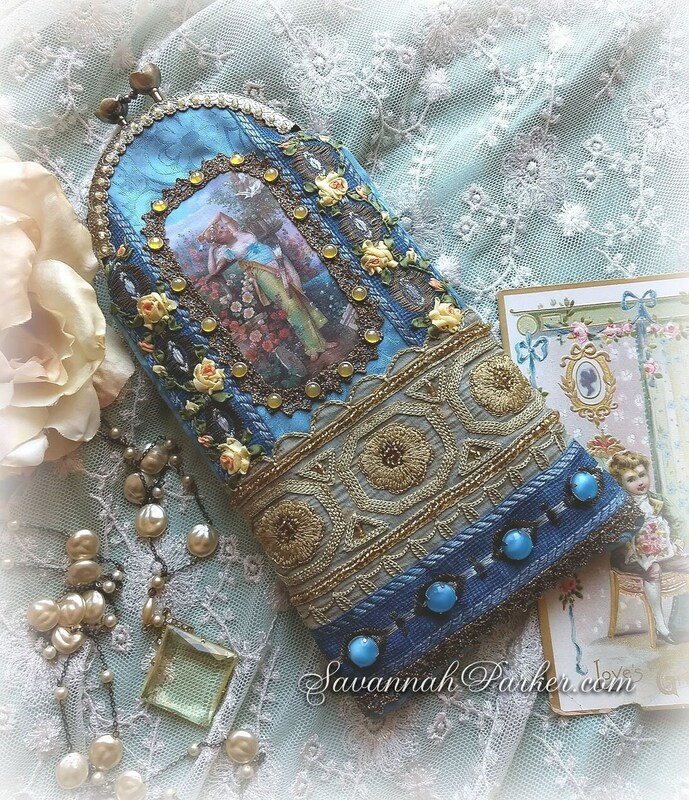 This incredible, one of a kind piece with a nostalgic, Art Nouveau jewel-tone theme was inspired by my love of antique Victorian, Edwardian, Art Nouveau and 1920's fashions and the delicate, beautiful beaded and jeweled bags that were made to accompany those styles....this is one of the many small-and-useful pouches and bags I'll be adding to my popular embroidered and jeweled purse collections! 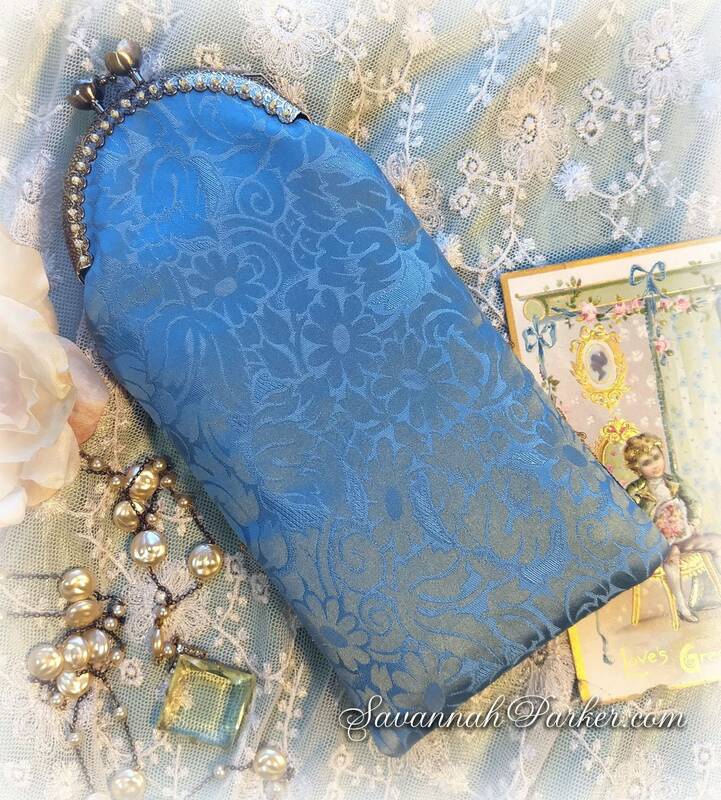 (Please see my other listings for other styles & colors) The body of this dainty little case, which is a hinged-frame, long-pouch style, is of sturdy yet very rich and delicate deep turquoise pure silk vintage brocade, substantially backed and padded so that your glasses or phone will be well cushioned! 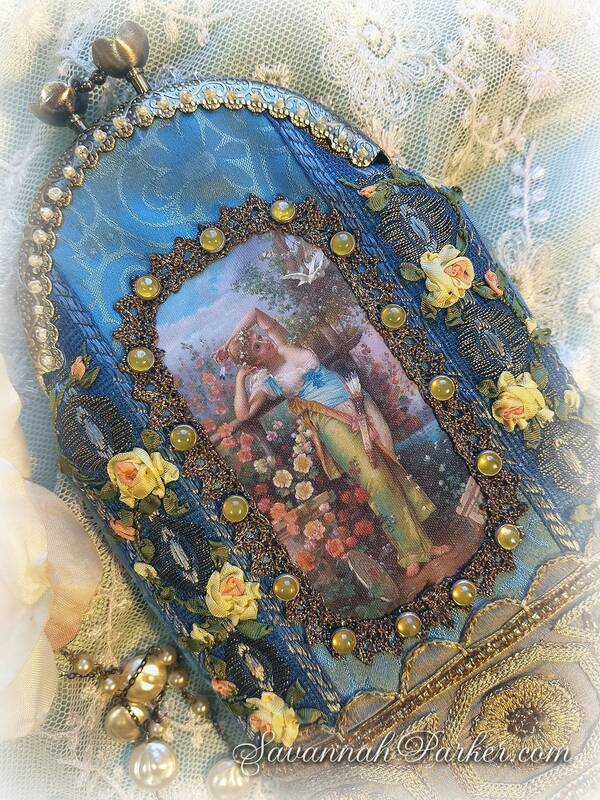 It's beautifully tailored and fully padded, and the front features a gorgeous print of an Art Nouveau lady in a garden, which I've surrounded with metallic antique-gold fine lace and the most luminous and very special little early 1900's vintage glass yellow moonstone glass cabochons set in metal settings and individually hand sewn on....these are VERY rare and the most wonderful shade of soft pineapple yellow....At the sides I have hand sewn on some wonderfully detailed antique trim woven in blue and gold, and on top of these I've hand embroidered garlands of exquisite, delicate silk ribbonwork roses in two-tone orange and yellow full blown roses and buds with green silk foliage to echo the colors of the flowers in the center print; while along the bottom of the case I added more of this trim accented by large antique turquoise blue glass "moonstone" buttons set in metal settings. A wide band of exquisite antique hand embroidery and gold beadwork on sage silk at lower center adds the finishing touch to this beauty.... There's a small loop on the frame to add your own strap, ribbon or chain if desired (ribbon/strap/chain not included). Perfect size for the essentials: eyeglasses or cell phone; or a compact, and a lipstick or two---This case fits my Android phone perfectly, but please check to make sure this will be right for your individual needs as there are NO RETURNS: measurements of this beauty are 8" by 4-3/8", a dainty yet standard size to hold all the little necessities. The metal frame opening is 3-1/4" in width so if purchasing as a cell case do make sure your phone will fit through this opening size. 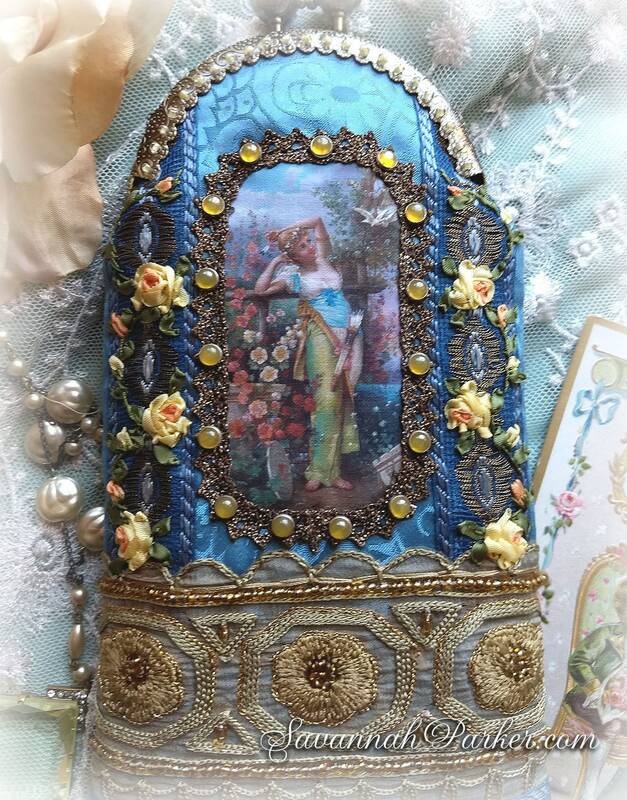 (my large 2018 Android Moto inside its additional shell casing fits easily through this, but some of the newest extra-large phones might not) Fabulous gift for a special person and a wonderful evening, event or wedding bag, or even just a gorgeous display piece! 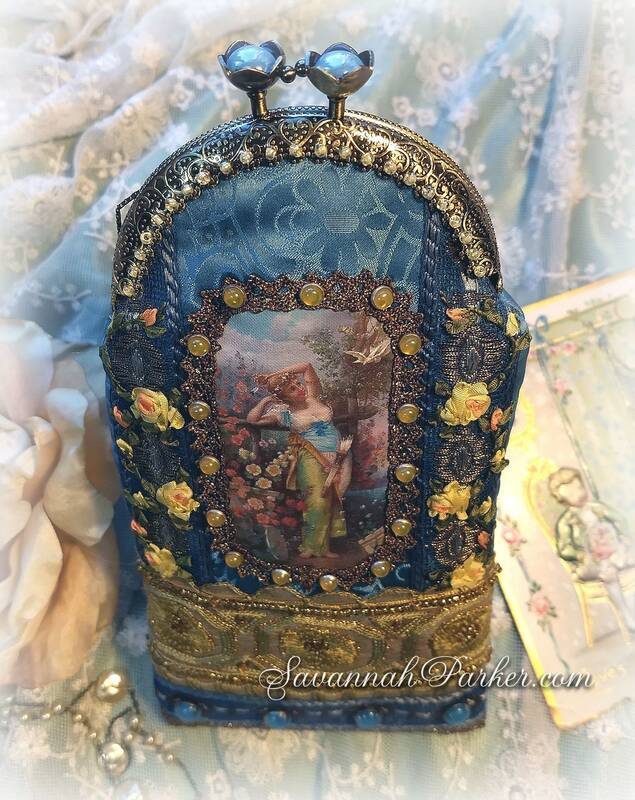 Complete photo albums of all the details of each of my creations are always available to look at on Facebook and on my website at http://www.savannahparker.net and http://www.savannahparker.com so be sure to look there for more detailed photos of this purse (incl. closeups) there....there are quite a few for this beauty and lots of detail. Please make sure this will suit you as to size and style before you purchase.....I don't accept returns or do alterations, sorry! Also, please be sure to read my shop policies/shipping info in full BEFORE you purchase (click on "policies" on my main shop page). Do check my other listings for more bags and purses coming up very soon, as well as my very popular antique-style hats, clothing, jeweled frames & fabulous jewelry.....I try to list new items at least weekly....always a great selection of handmade vintage and antique inspired beauties including the gorgeous coordinating jewelry for the total vintage look. Thanks for visiting!